The graduate of biology obtains a thorough knowledge of general biology and specialistic knowledge of analytical biology and environmental biology. The graduate is prepared to be employed in scientific-research institutions, epidemical and sanitary centres, departments of animal and plant keeping and breeding, services and institutions that protect the environment, public health monitoring units and in education. The graduate is prepared to work in medical laboratories, pharmaceutical laboratories, and industrial laboratories (e.g. food industry), as well as in forensic laboratories (after II degree studies), cosmetic laboratories, laboratories that monitor and protect the environment, and biotechnological companies and laboratories. Bachelor - I degree full-time studies at the Faculty of Agricultural Sciences in Zamość last for 3 years. The graduate receives a Bachelor’s title in the field of biology. 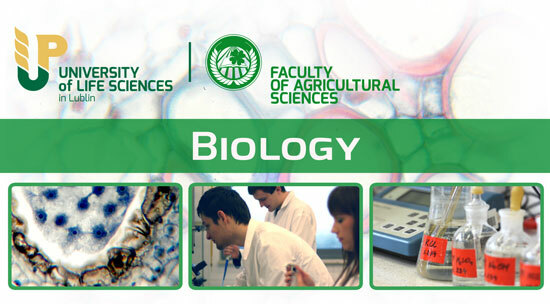 There are two specialities in I degree studies: analytical biology and environmental biology (one to be chosen). Master - II degree studies can be taken at the University of Life Sciences in Lublin and last for 2 years. The graduate receives Master’s diploma in the field of biology (specialities: biology in Court, applied biology).